SCHAUMBURG, Ill. (WLS) -- A rare $4 denomination U.S. gold coin, made in 1880 and one of only ten known of its type, sold for $1,821,250 in a public auction in the northwest suburbs Thursday. 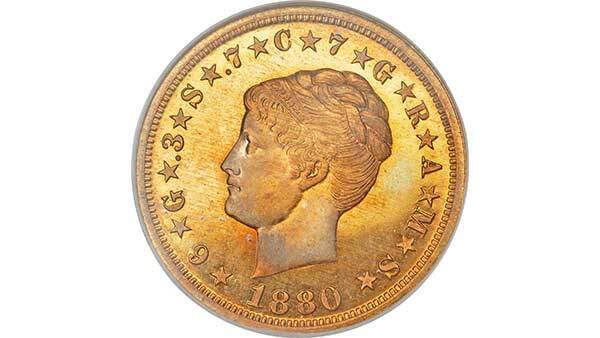 "The odd $4 denomination coin was proposed for use in international trade, and a small number were experimentally struck at the Philadelphia Mint in 1879 and 1880 before the plans were abandoned," explained Greg Rohan, President of Heritage Auctions, the Dallas-based auction house that conducted the sale. The buyer of the rare 19th-century U.S. gold coin, who wants to remain anonymous, placed his winning bid online from Great Britain, according to Rohan. "These historic coins are known as 'Stellas,' named for the five-pointed star design on the back side. Some of the Stellas depict the symbolic 'Miss Liberty' with flowing hair on the coin's front side, and some have her hair coiled on top of her head. Only ten surviving coiled hair examples are known from 1880. This particular coin is in superb condition and last appeared in an auction in 1991 when it sold for $440,000," said Rohan. The $4 denomination gold coin was sold by Heritage as part of a multi-million dollar rare coin auction that continues through the weekend in Schaumburg and online at www.HA.com.